Beagle 1 in. Field Trial Dog Collar Pack. $39.95. "Good quality and value product"
"My husband and son in law love, love, love them!!!!!!!" My husband and son in law love, love, love them!!!!!!! "Collars and tags look great"
Collars and tags look great. About to start hunting for the next 10 weeks off and on. I will let you know how they do after that. "This is our second order of these collars cause we love them so much." This is our second order of these collars cause we love them so much. Great price and great quality! We buy all of our hunting dog supplies from gun dog. "Collars are excellent, nice bright colors"
Collars are excellent, nice bright colors, no problem with dogs scratching or chewing at the collars. Would like to order more of the same.
" I will be ordering more from Gun Dog Supply." I ordered only 1 set to see the quality of product, as my husband and son have just started field trials. I will be ordering more from Gun Dog Supply. Received my shipment in a very timely matter. Great buy! Excellent follow up and ultra fast delivery time. I highly recommend these folks! "Everything was great. They look good." Everything was great. They look good. Bluetick beagle. Hunts. Family pet. "You can't beat the quality of the price"
You can't beat the quality of the price, and shipping is always fast. 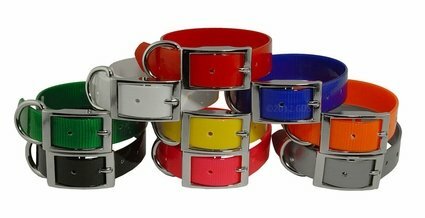 Includes 9 different colored collars with FREE ID plates! This collar set is perfect for the Beagle Field Trialer. 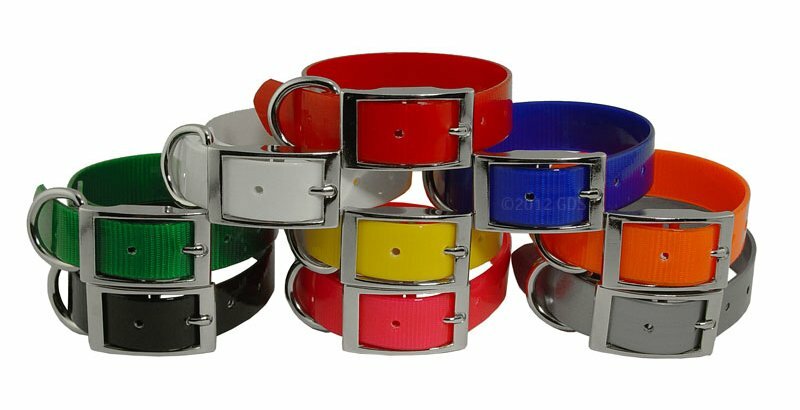 The 9 collars fit the AKC requirements of color and come with Free ID plates. Includes Red, White, Blue, Green, Yellow, Orange, Black, Pink and Silver collars. Choose 17" or 19" collar size. The collars feature single-ply polyurethane coated nylon and are bright colored, highly visible, light, inexpensive, soil and odor resistant, water repellent and long lasting. Heavy gauge nickel plated hardware & capped rivets. Made in the USA. To ensure a perfect fit, measure your dog's neck before you order. Add 4-5 inches to dog's actual neck measurement to order the proper length collars on this page. If you want room for growth or a "loose" fit, add more. Measurement should be made near the middle of the dog's neck. When you order this collar set, you get a FREE 2.75" x .75" 3 or 4 line machine-stamped brass I.D. plate which we attach to each collar using rivets. All 9 ID plates will have the same information. Enter your contact information in the blank form above. We recommend that you list multiple phone numbers along with your name, city, state, and address if you have room. Our tags will fit up to 4 lines of information. The top and bottom lines are longer and will fit 20 letters. Lines 2 and 3 are shorter - fitting only 18. This is because of the placement of the rivets. Be sure to read my article on Important Dog I.D. Tag Information.